It’s been nearly a decade since the release of a 2009 report by the Special Investigating Unit into the Bosasa group and the role of key Correctional Services henchmen in the awarding of lucrative contracts to the company going back to 2004. On Wednesday morning, the company’s former chief operating officer, Angelo Agrizzi, added his take on evidence and findings in the report when he confirmed – and provided more detail on – significant aspects previously provided by independent witnesses for the SIU’s own investigation. Agrizzi was never interviewed by the SIU but has now become a whistle-blower at the State Capture inquiry where he has been spilling details of years of alleged costly corrupt practices by the company which allegedly spent up to R6m a month on bribes. The SIU concluded its report in 2009 and to date, none of its recommendations have been implemented. Those included that the Department of Correctional Services instituted disciplinary and civil proceedings for recovery of the money paid through the unlawful deals and for the National Prosecuting Authority to institute criminal proceedings against the company and the responsible senior officials. Agrizzi says NPA Officials were paid to protect Bosasa from Persecution. The three officials received monthly payments since 2010. Agrizzi had earlier testified about major operations to delete files at Bosasa whenever there was a whiff of a raid by authorities. The SIU report contains exact details, gathered by a cyber forensic expert, that illustrate the deletion of incriminating records and data. The SIU expert had examined the Bosasa servers and using keyword searches, detected the alleged mass deletion of files, particularly those relating to the company’s Correctional Services contracts. The files, the SIU investigation found, were deleted several days ahead of a scheduled visit to Bosasa where its investigators were to mirror electronic files. This was after Bosasa, through lawyers, had negotiated a postponement for the SIU visit. During the company’s special project, archive documents were overwritten and deleted. The SIU report states that the timing of that coincided with the postponement. The SIU report confirmed the deletion of batches of files ranging from 116 up to 30,000. Agrizzi told the Commission that a discussion about the plan to delete electronic information had come up during a meeting (also attended by the company’s legal representatives). The same deletion tools used at Bosasa’s offices were allegedly used to destroy evidence on devices linked to former Correctional Chief Financial Officer, Patrick Gillingham. But there it appears to have been much less effective as investigators found key pieces of information linking him to Bosasa. This includes a business card of one of the Bosasa subsidiaries with his name on it and an email address that had previously been used to transfer bid documents between Bosasa and himself. Agrizzi said Gillingham had been roped in to attend a meeting with Bosasa for a different deal so the company created the business card for him. While piles of documents were deleted, the SIU’s expert managed to recover a significant amount anyway, the commission heard. “They were cleverer than us,” Agrizzi said in jest. The SIU report, like much of Agrizzi’s testimony, names Gillingham and former Correctional Services Commissioner, Linda Mti as key players who allegedly helped ensure that Bosasa bagged four lucrative contracts – in exchange for bribes. The two allegedly did this by helping Bosasa with essentially engineering the deals from the onset and later on, with drafting the bid specifications to give the company a competitive edge as well as the irregular extension of some. 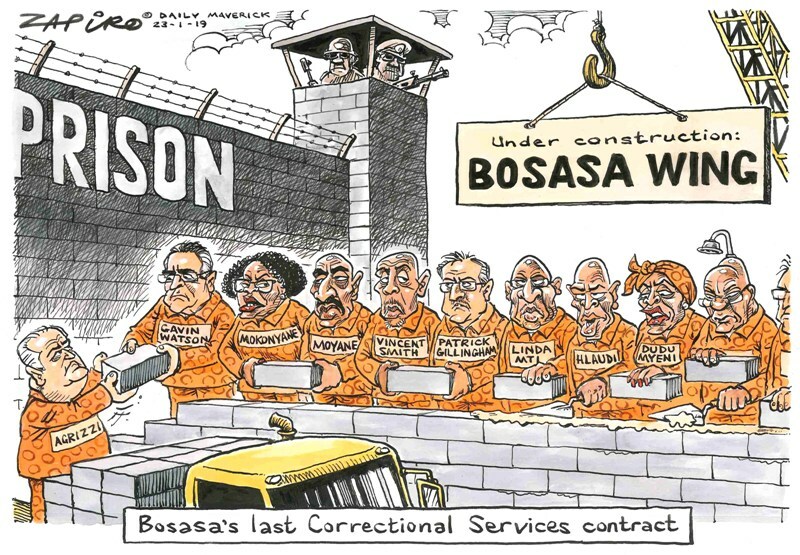 Bosasa secured a catering contract, a CCTV deal, another for high-security fencing, among others, over several years during which they allegedly had Correctional Services Commissioners in their pocket.